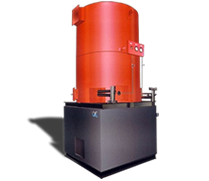 Vertical 3-pass thermic fluid heaters are compact in design and fit very well where space is a constraint. Less cleaning required compare to horizontal design. 200,000 Kcals/hr to 800,000 Kcals/hr and Temperature up to 300°C. Coal, lignite, wood and all type of agro waste.